Following a sugary breakfast of crumpets and waffles, The Astronomer, Rosalind, and I boarded an express bus to seek out even more sweets to stuff down our gullets. 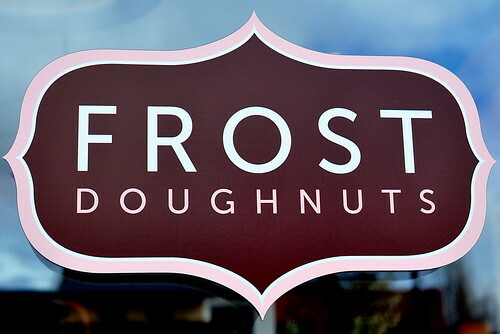 My friend and Seattle native Alice scooped us up from a random bus stop somewhere north of the city and drove us to Mill Creek, the home of a glorious little doughnut shop called Frost. Although the trip was comparable to traveling from Pasadena to Glendora to visit The Donut Man, the voyage somehow seemed more epic because we were in a foreign land. Plus, gray skies and rainfall always add a bit more drama to any situation. 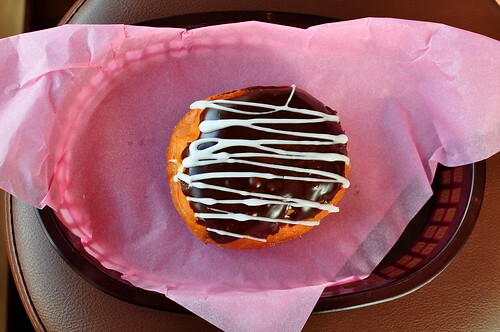 Opened in July 2009, Frost aims to make the best doughnuts anyone has ever tasted. Alice, a connoisseur of all things delicious, is a huge fan of the shop’s sophisticated, indulgent, and gourmet offerings. To taste as many flavors as possible, Alice and I split a dozen doughnuts ($16) between our two parties. Purchased a la carte, doughnuts are priced between 99 cents and $1.89. The Astronomer, Rosalind, and I carefully chose six doughnuts—clockwise starting from top left—a French Cruller with Maple, an Aztec Chocolate, a Lemon Bismarck, a Bavarian Crème Bismarck, a Smokey Bacon Maple Bar, and a Strawberries & Creme. The French cruller was studded with airy pockets that made it so incredibly light and eggy that we swore we were eating a sweetened popover. The maple icing had hints of real maple syrup. 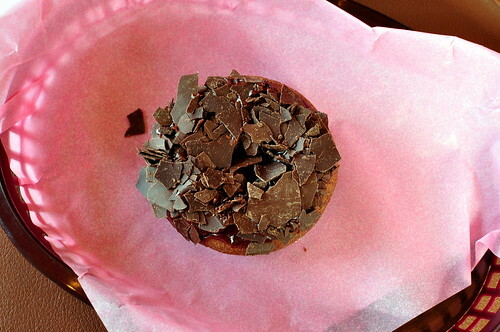 The Aztec Chocolate was comprised of a moist chocolate cake doughnut iced with a cinnamon-cayenne ganache , and topped with chocolate shavings. I loved the bold spicy notes and how the thin shards of chocolate melted in the afternoon sun. Just as Alice promised, the textures of the Bismarcks were downright perfect. The Astronomer adored the tart and unabashedly lemony curd filling. I was a bigger fan of the Bavarian crème variety, because smooth vanilla custard is more my style. The doughnut that made me close my eyes and tilt my head in utter bliss was none other than the Smokey Bacon Maple Bar. A maple bar is pretty amazing on its own; add to it freshly fried bacon crumbles, and man oh man, this baby is a heart breaker. Heck, it’s breaking my heart at this very moment because there are 1,158 miles between us. Nickel Diner can’t compete. 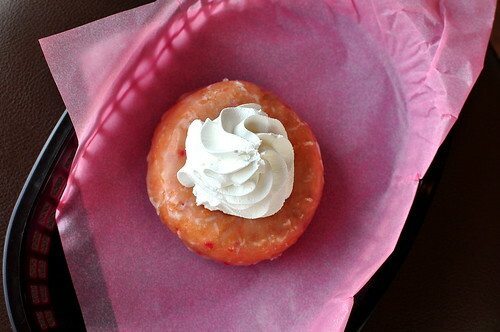 And lastly, a pretty in pink strawberry cake doughnut topped with whipped cream. We loved how the doughnut was full of fresh fruit. We headed back to the city with a box full of half eaten doughnuts and happy thoughts of Frost. 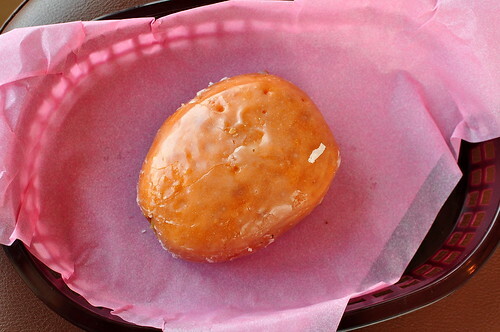 Dear God, Please bring Frost Doughnuts to Los Angeles. Love, Cathy. Oh dear god… I would decide to browse the food blogs at 3am. Loves it. Oh boy, I think I just had a foodgasm. Love the team doughnuts 🙂 I personally fancy the versatile status to work as breakfast, sweets and snack! so if you could go to only one, you would choose frost over top pot? Bacon really does make everything better. 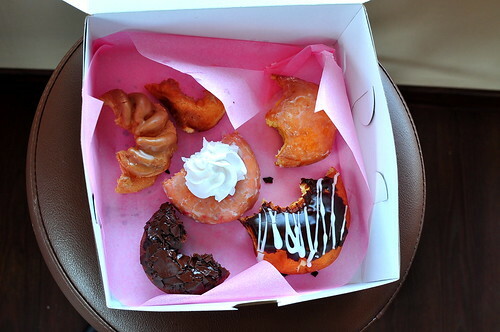 Wow….those are some of the best donuts I have ever seen. I hope your prayers are answered too! those look so amazing. i personally could have eaten all the leftovers, btw. Sarah – Top Pot < Frost. Both companies make excellent doughnuts, but the texture of Frost's is more special. ohhhh man! as i was reading this, i was saying to myself, man, i can’t wait til this weekend because i’m gonna get me some of these sweet doughnuts! and then i realized it’s in washington. huuuuge bummer. I wish I could fly up to Seattle just to try these! 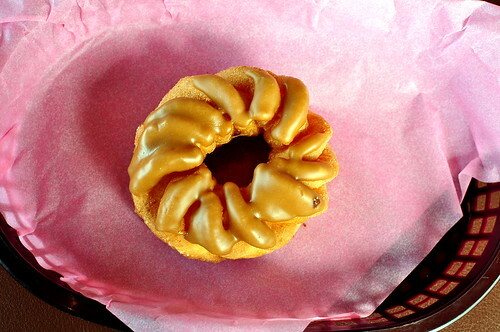 Donuts are one of my favorite guilty pleasures! As a Southern Californier, I’m also a fan of the Donut Man (even though it’s an hour drive)! I insist that you stop posting pictures of delicious looking donuts in another state and taunting us with their yumminess! Oh, who am I kidding? We love it. Forget the road trip to Phoenix for Pizzeria Bianco, can we road trip to Frost?!? Pretty please? With bacon on top?? i think i just died and went to heaven! if there’s an award for food photography, you win, and especially since this post is all about my favorite subject — donuts! Those donuts are ridic! Definitely a must try when I get up there. Would it be taunting to say that I live in Mill Creek and every Thursday I hit frost right as they open at 6 AM. You have not lived until you’ve had a warm Black Forest Fritter (Cherries in the donut with a chocolate drizze on top) who’s glaze hasn’t even set yet! I am so hungry for donuts! 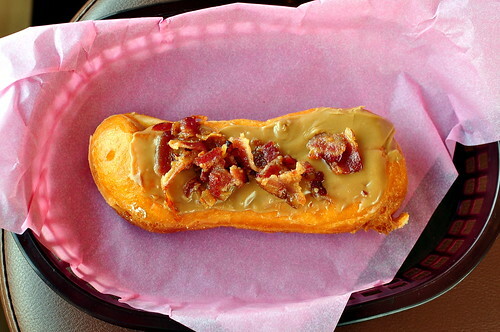 we need better donuts places in LA i really want a maple bar with bacon! Pete – You’re living the dream! I don’t like donuts, and you brought me into the light with Donut Plant. Now Frost Doughnuts looks utterly divine! OMG, stumbling across your blog so many months ago is now the best discovery i have made online. otherwise, i never would have known about frost. can we tag team a los angeles franchise? Sarah – Heck yes!! 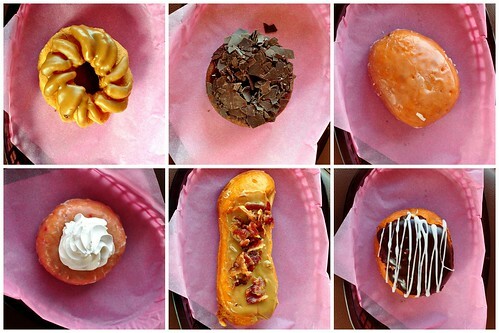 This place would RULE the LA doughnut scene! Look into it! wow! never knew this place was in LA. My daughters just love doughnuts, so i thank you for sharing. Erica – Frost is located outside of Seattle, not Los Angeles.